Big waves are believed to be one of the biggest dangers at the beach. But what about small waves? "Early Show" consumer correspondent Susan Koeppen took a look into the surprisingly big hazard that comes with small waves, on "The Early Show" Monday. Every year, hundreds of swimmers are injured by waves. However, a little-known fact is that waves don't have to be huge to cause damage. Shore break -- when small waves abruptly break in shallow water -- can pull swimmers off their feet and into the hard sand at the ocean's bottom. That's what happened to Josh Basile, of Potomac, Md. Basile was paralyzed from the shoulders down after being thrown from a wave during a summer vacation in 2004. "I was just in waist-high water," Basile said. "(The) wave came behind me, picked me up, and dropped me on my head." Basile said he didn't have any pain when he was thrown into the sand, but when he tried to turn himself, he couldn't. "My accident occurred because I let my guard down," he said. "I just wasn't really aware. My only worry at the beach was, 'how much fun am I gonna have?' I never thought a vacation would turn out the way it did." Butch Arbin, captain of the Ocean City Beach Patrol in Maryland told Koeppen every season his life guards handle more than a hundred rescues involving swimmers who've hit the ocean floor. He said, "The problem with these types of accidents is they happen in a split second." The United States Lifesaving Association calls shore break an international problem, which causes debilitating injuries -- even death. 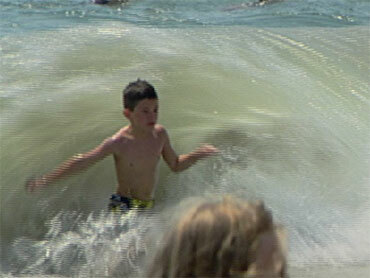 Arbin said Ocean City lifeguards use real-life rescues to educated beachgoers about the danger of shore break. He said lifeguards pull crowds out of the water if they see shore break, and explain what's going on in the water. Koeppen reported signs warning of shore break are being used at some beaches in the United States, and there's a push to develop an international warning system. 3. If you start getting tossed around, put your arms out in front of you to protect your head and neck. A broken arm is better than a broken neck.